Are you torn between buying one more appliance for the kitchen, and one more box of store-bought waffles? If you need one more reason to start making fresh home-made waffles, here you go: millet waffles! Millet-wheat waffles, that is. These are easy to make and use equal parts of millet and whole wheat flour. This recipe uses mashed ripe banana in the batter. If you don’t have a ripe banana on hand, you may use 1 TBS honey or molasses in its place. This will provide a mildly sweet tone to the background without overwhelming the hearty flavor of the waffle. 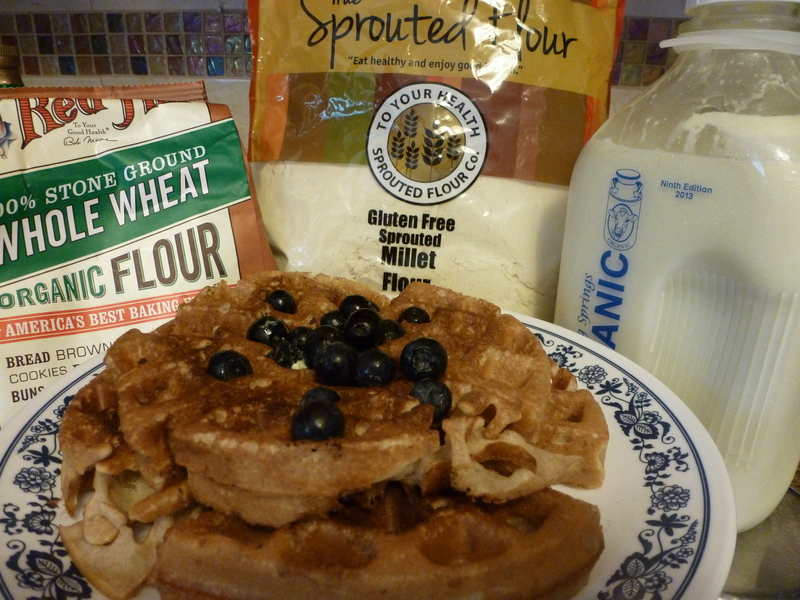 In the waffles pictured above I used sprouted millet flour which I got from a company called To Your Health in Alabama. Pour batter into the waffle iron. It should cover all four quadrants. How to make the waffles: Mix dry ingredients well. Add wet ingredients and mix thoroughly. You can use the batter right away but if I can I let it sit for 20 minutes or so. Seems to help. Some suggest adding chopped nuts or berries to the batter but I think it tastes better if you add them on top of the finished waffle instead. 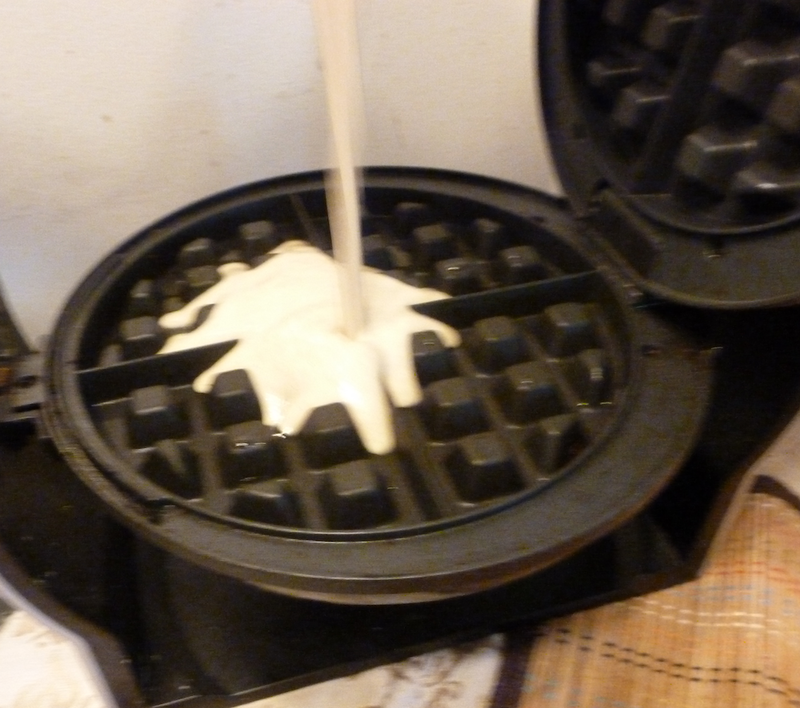 Using an electric waffle iron, pour the batter according to the instructions of the waffle iron. Hint: Make sure the waffle iron is hot before you pour in the batter. Make sure to get batter into all four quadrants. I usually apply some oil or butter before the first waffle but not to any subsequent waffles. Serve with chopped nuts and fruits. A dash of butter and maple syrup also tops it off nicely. You can use the same batter to make pancakes. Previous What can we make with Millet in the United States? Great post !! Wealth of information !! I have been trying to include all kinds of millets in our diet and it was such a blessing to see you explore various recipes and share with us !! Can I know where exactly we can get all kinds of millets in USA ? A number of grocery stores will carry at least one kind of millet, which they will likely call “millet” – that is proso millet. Asian grocery stores might have a few more kinds such as foxtail millet, little millet, jowar and bajra.